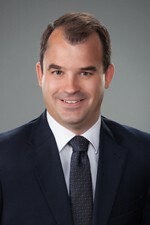 Jeffrey Hoskins is a civil litigator who represents businesses, governmental entities and individuals as plaintiffs and defendants and helps clients effectively resolve disputes involving a wide range of matters. He often represents businesses, individuals and municipal entities in environmental and zoning law and litigation. In addition, Mr. Hoskins is experienced in handling disputes, administrative hearings and litigation involving various land uses and also handles commercial litigation matters, including, business and commercial disputes, contract law, creditors' rights, foreclosures, insurance coverage, landlord-tenant disputes, and real estate matters. He also has assisted in representing parties on appeal and is a certified arbitrator for Illinois' 17th Judicial Circuit Court. Prior to joining Hinshaw & Culbertson LLP, Mr. Hoskins was for more than eight years an associate with a Rockford, Illinois law firm, where he represented parties in general civil litigation. While in law school, Mr. Hoskins, a dean's scholar, was a member of The John Marshall Law Review. He also was a Moot Court Board member, a semifinalist in the Fred F. Herzog Moot Court Competition — in which he took second best brief honors — and a member of the Trial Advocacy and Dispute Resolution Honors Council. During law school Mr. Hoskins practiced as a 711 Law Clerk with the Felony Trial Division of the Cook County State's Attorney's Office in Chicago, where he gained substantial and valuable trial experience. He also clerked in the Traffic Division during his first year of law school. Mr. Hoskins is a 2008 graduate of the Rockford Chamber of Commerce's Leadership Rockford program.